I’d welcome some advice on soil mix ratios. I’ve built a raised bed 6x2x0.4 metres, out of thick timber railway style sleepers. It is sitting on native soil in a south facing very sheltered part of the garden. There’s 2 metre fences all around and a dense woodland behind. I’m in the north west so it can rain a lot !! 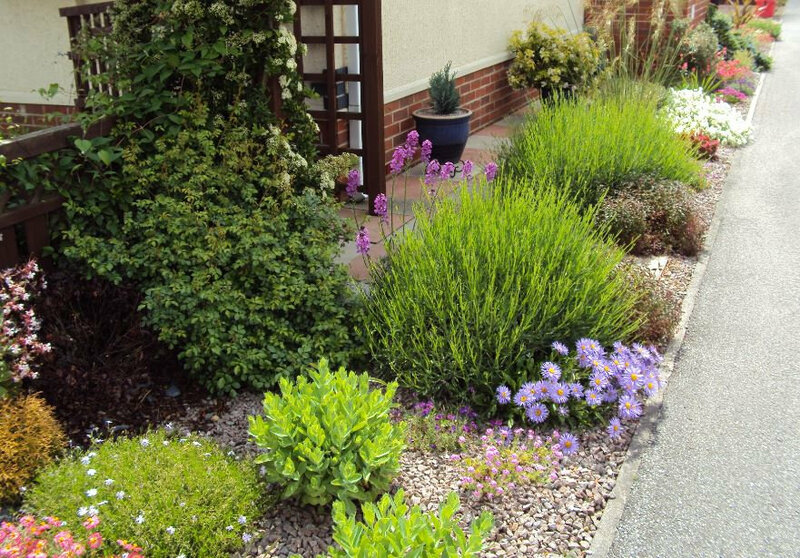 I’d like to do a Mediterranean style area if I can with a couple of olive trees, under planted with agapanthus, glauca festuca, lavender and a few buxus balls. What soil mixture would you suggest? I was thinking 1/3 screened top soil; 1/3 peat based compost and the balance a mixture of sharp sand, pea gravel and leaf mould. Does this seem right? I know it needs to be well drained but I’m new to this and don’t want it to dry out too quickly. In lieu of anyone else answering you - I normally only check the 'Plants' section here, but let me say that your mix is far too rich for a Mediterranean style border... those plants do not grow on peaty soils enriched with leaf mould... I had a med style border until recently, and all it comprised of was garden soil mixed with copious amounts of pea gravel... in my opinion you're going over the top with all the other stuff..
..this was my dry garden, as it's called nowadays... just garden soil with loads of rubble in it, stones, lots of gravel, and absolutely nothing with any richness... I could have planted olive shrubs but they were not for me.. best of luck..
I’ve already got enough top soil to fill about 40% and maybe another 15% compost so if I do the rest with pea gravel and sharp sand that should be ok shouldn’t it? The drainage of the soil below is very good. I’ve tested in a few places and a 1x1x1’ hole filled with water drains in under 90 mins. Yes, lay off the peat and leafmould! Your revised mix sounds ok and add a mulch of pea gravel on top as well. I have a Mediterranean style 40cm border and thats fine for lavender, etc., but sounds a bit tight to plant olive trees underplanted with agapanthus. I would rethink the agapanthus and consider putting them in pots, as they like a slightly richer growing medium and the occasional tomato feed. They need to be well watered throughout the summer to mimic their south african origins, but kept dryer over winter. Some varieties are quite tender, if they are in pots you could move them to a sheltered position for winter where they are protected from too much winter cold and rain. The leafmould was kind of by accident! There are tall beech, ash and birch trees at the back of the house (to the north of the raised bed).